Ulefone Power 2 is a smartphone in the same category as the likes of the Vernee Thor Plus. It comes with a colossal battery, huge display, an octa-core processor and respectable RAM capacity. The Ulefone Power 2 features a design that is both elegant and durable. It shows off a metal chassis, although some may mistake it for a plastic-body phone from a distance. The chamfered edges should make for firmer grip. As for the display, you get a large 5.5-inch unit with Full HD resolution. So, this is a device that should be good for viewing content with your friends. You will find a 16 megapixel shooter with 6-element lens on the rear of the Ulefone Power 2. It has fast autofocus, shutter and specially optimised software, according to its maker. The company says it promises true-to-life images. On paper, the selfie shooter also sounds like one to impress at 13 megapixels. It offers 14 light filters and 100-stage beautification. You can expect great selfies, even at farther distances using a selfie stick, according to Ulefone. Ulefone Power 2 gets processing punch from an octa-core MediaTek MT6750T processor. The 64-bit chip offers speed that maxes at 1.5 GHz. According to the phone maker, you can expect the Ulefone Power 2 to run more demanding games and apps with ease. That is believable to an extent when you consider the 4 GB of RAM available. At 64 GB, inbuilt storage is also abundant. Ulefone Power 2 boots Android 7.0 Nougat operating system. As its name suggests, the Ulefone Power 2 is a power-heavy phone. It comes with a 6,050mAh Li-Polymer battery. Ulefone claims this is a juicer than can last up to four days on a charge. Pump Express 2.0 fast charge technology lets you fully top it up in 2-3 hours. You also get a fingerprint scanner integrated into the Home button for unlocking. Expect lightning fast mobile data speeds with 4G LTE (Cat. 6) connectivity. There is support for Voice over LTE (VoLTE) as well. Ulefone Power 2 is available in Nigeria, Ghana, and Kenya. The price starts at $148.99 at Banggood. You can buy the smartphone at leading online stores in your country. 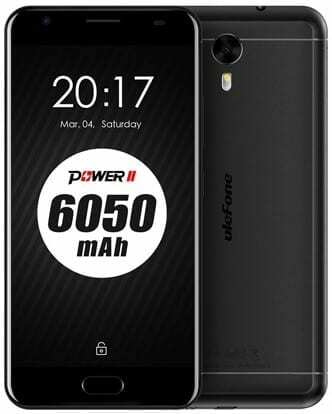 Ulefone Power 2 Price in Nigeria is expected to range from 56,000 Naira to 95,000 Naira.